If you want to create a video tutorial of any application, record videos from the Internet and capture the best moments of your life, you need a program like Recordzilla, which records on video everything that happens on your computer's screen. The program has a very simple interface, from which you can select the quality of the video, the resolution and the size. The application doesn't require any kind of special knowledge to make the most of it. - Capacity to save videos in AVI, WMV, FLV or SWF format. - Option to record the conversations that you maintain by means of a webcam. - Function to add your narration by means of the micro input. - Add the time and hour to the files that are generated. 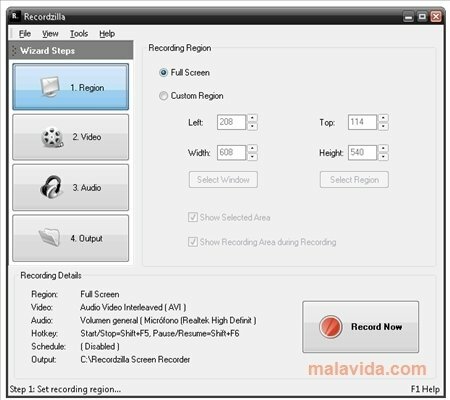 Discover a great utility for the creation of screencasts, after installing Recordzilla on your computer. Don't miss out on this opportunity! The trial version can be used up to 8 times.